Great by Choice blew me away. I think maybe based on where I am in my entrepreneurship journey – 20+ years and counting – that it hit me at the perfect time. Also, I listened to it on Audible and the person reading it did a great job. What I gathered from this book above all else is the power of patience. When you want to build a great business, patience seems to be the key that solves every challenge. I expect that I’ll read this book several times over the next ten years. 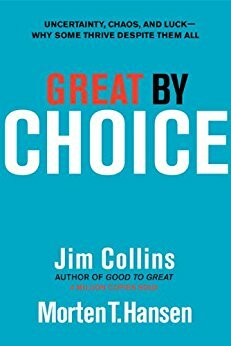 And honestly, when I first tried to read the author’s book, Good to Great, which EVERYONE says is incredible, I just couldn’t get into it. I felt like it was talking at a level that was too far beyond what I’d ever experience. Concepts that focused on coordinating global teams just didn’t seem like something that I could relate to. But Great by Choice, while still dealing with massive, global companies, spoke directly to me.